Relax and enjoy your stay at this elegant Country House tucked away in the unspoilt beauty of Killarney’s Lake District. This hidden treasure, nestled on the northern shore of Killarney’s great lake, Loch Lein, offers magnificent views of the Macgillicuddy Reeks. A gateway to the Ring of Kerry, it is an oasis on this splendidly spectacular route – the ideal location to explore and experience local hills, National parks, world renowned golf courses and the magic and beauty of the Kerry landscape. Your Hosts, Annette & Paul Corridan are always on hand to meet & greet; to recommend undiscovered local walks and less travelled roads, in fact, to help in any way. Annette & Paul display a genuine emphasis on personal service and high standards of Food and Accommodation. A friendly and informal atmosphere prevails at Loch Lein Country House putting you at ease from the moment you arrive. 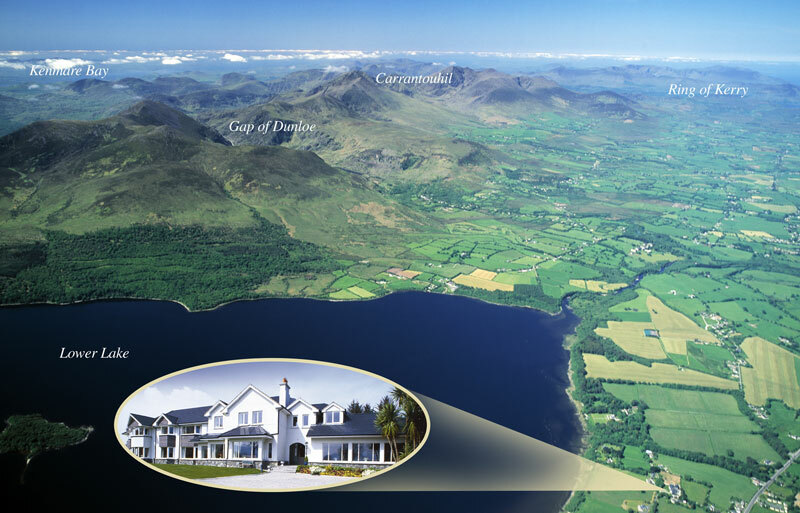 Allow yourself to indulge in deep cushioned comfort with views across the Lakes of Killarney. Spacious non -smoking bedrooms have many thoughtful touches to enhance a comfortable and relaxing stay. They have created a delightful little hotel that discerning guests will want to return to…time and time again.